After using Loom for a week to backup photos from my iPhone and iPad mini, I give the service high marks. I particularly like using the iOS version of Loom. It's easy to navigate and create folders for organization. The Timeline at the top of the organization panel shows all of your pictures in chronological order. Below that, each of your devices are listed where you can see the photos residing in each of them. Then, there are the albums. 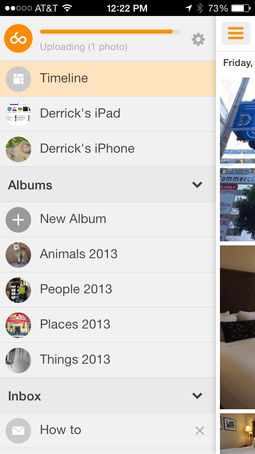 You can create a new album and add virtual copies of pictures to it. I've created my usual Animals, People, Places, and Things collections. When 2014 rolls around, I'll create categories for the new year too. As for the Web interface, I still haven't warmed up to it. Sharing images has been a challenge, and overall performance is clunky. It's almost as if the designers tried to port the iOS app to the computer browser. My hope would be that they revisit the web interface with fresh eyes. Aside from that nit, I would say that I'm quite pleased with my first week of using Loom. If you need to augment your mobile photography backup solution, it's worth a look.